In Lords of Waterdeep players will play as one of these masked Lords and will need to recruit adventurers to go out and complete quests for them. The more quests they complete, the more control and influence they have over the city. Players can expand the city by purchasing buildings that will open up new opportunities within the city walls. Intrigue cards can be used to help the player and may also either help or hinder their fellow Lords in their quest to become the supreme ruler of Waterdeep! Lords of Waterdeep is a turn-based strategy game played in 8 rounds and can be played against AI or with up to 5 human players. Players take turns assigning their agents to do their bidding, whether it is to recruit new adventurers to their tavern or purchase a new building for the city. Points and resources are gained by completing quests, playing Intrigue cards, constructing new buildings or having other players utilize the buildings you have constructed. At the end of the 8 rounds bonus points are awarded and the player with the most points at the end wins the game. 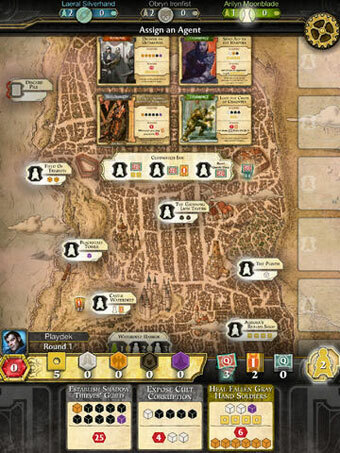 Game Overview: Lords of Waterdeep is a worker placement game. By randomizing the secret Lord Cards at the beginning of the game, the quests available to choose, the buildings available to build, and the intrigue cards one is able to play, the game is very different each time you play. Please reference the Lords of Waterdeep (board game) for an overview of the game mechanics and others reviews. •	Makes the game much faster – Typical board game set up is 5 minutes. Digital is 0. In game, the app takes care of moving all adventurer tokens (the colored squares) and you don’t have to worry about counting them. The totals of each color and your money are immediately visible. Also, your opponent totals are visible by tapping on their icon. The game also puts a colored ring around the quests that you have the resources to complete at the end of each turn, reducing the chance you accidently skip completing a quest. •	Keeps track of all points – There are several quests that give you bonuses for completing similar quests. Unlike the physical game, the app will not allow you to miss those bonus points. The app takes away all need to watch everyone’s math. You know the computer will be accurate. It also speeds up the end of the game. Typically, adding final points can take 5-10 minutes depending on the number of people playing. The app reduces this to 0. 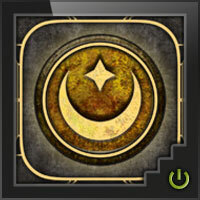 •	Undo Button – There is no penalty for using the undo button in your turn. Perhaps you didn’t have the resources you thought you did. You can hit the red arrow on the left of the screen and go back to the beginning of your turn. The exception is if you have seen a new card. If your action revealed a new quest, building or intrigue card, there is no undo. Obviously, it would give you an unfair advantage if you got to peek at the next cards! •	Solo games – Great way to pass the time! You can add up to 4 other app controlled players and each can be given a different difficulty level of easy, medium, or hard. They all play very similarly but on easy, if there is an intrigue card that will give an opponent an extra resource, the player will get it. Also on easy, you will almost never get attacked with a mandatory quest or an intrigue card that takes away a resource. On medium, the player gets a resource about half the time and may get attacked 1 out of 3 times. On hard, it seems that you never get the benefit and will almost always be the focus of the attack cards! •	Play with someone next to you – the app offers two ways to play with other friends. First, you can play and pass. You play, then pass the phone or tablet to the next player, then to the next. There might be times for this but I find that people get board when they can’t see what the next person is doing. The game replays the other players moves so you can see what happened but the down time in between is not the best. Second, you can create an account through the game and play online. This takes a little preparation but once it is set up, I like it a lot. It is a great way to pass the time at a doctor’s office or at an airport! Each person needs to have the app downloaded on their device and setup an account online through the app. This can take a few minutes as it pings your email to make sure you are a real person. Once everyone has an account, you can choose Play Online, Profile +Friends, and Add Friend with either their email address or their user name. Back at the Play Online Menu, Create Game and drag the icon of the friend(s) you want to play over to the right hand active field. Choose how long you want each person to have on their clock. We often set the clock for a day as it counts the time the other person is waiting on you. If the clock runs out, you forfeit. This prevents games that drag on and on. You can choose anything from 30 minutes to 45 days! Finally, choose any extra expansions you want to use and start the game. Note, if you add the use of an expansion, each person has to have that expansion on their device. The app does not allow “families” in Apple to share the expansions. Each account has to buy the expansion separately. •	Play with Others – The app has a built in game finder online so you can play with others looking for a game. It also tries to match you up with players similar to your level, based on your past online games. This is not a feature I have used much as I prefer to play people I know. •	Trophies – I love trophies. In the apple version with Game Center turned on, you receive trophies for games played, buildings built, wizards collected, etc. It is one of the small benefits I really like. •	Expansions – The Skullport Expansion and the Undermountain Expansion are each $2.99 and cannot be shared between each person in a family account (though the main game can). They each add a huge variety to the game, specifically Skullport and I strongly recommend adding them. •	The Downside to the Digital Version – It can take away the interaction that a table top game brings out in people. The board version has a place in our regular gaming group. However, the digital is great to have in your back pocket when you find yourself waiting somewhere. This is one of those fantastic “board-to-digital” game translations where the digital may possibly surpass the original. Lords of Waterdeep is basically a puzzle within a game; “how do I string this goal into that goal, then keep the ball rolling?”. On a tabletop, it’s easy for things to go sideways, as multiple players can usually piece together what your plan is. In app form, it’s much harder for table talk to ruin your scheme. Playing Waterdeep solo in app form simply shifts the focus of the game from a social experience to a logic puzzle. Adding to the puzzle experience, the fact that the app circumvents the original’s setup and teardown just expedites your next game. The computer rarely takes more than a few seconds to evaluate a turn, and you can finish an entire game in around 30 minutes (sometimes less). As such, it’s a great “solitaire” time-killer game for your phone or tablet. Picked this up when it was on sale and play it all the time. Playdek did a great job translating the game to a digital format. They even came up for a way to get around online players who start a game, but never come back to it when it’s their turn. They did this by implementing a kind of chess clock. When it’s your turn the clock counts down. If it runs out then your kicked from the game, and the CPU takes over for you. The game is easy to learn, and after a few games you could play the physical copy without needing to look at the rule book. Replay value is very high, since no two games will play the same. Add a Review for "Dungeons & Dragons: Lords of Waterdeep"